Have You Been Injured While Visiting Nevada? There are many people in the San Fernando Valley who make a quick drive over to Nevada for a short vacation. Some need a weekend in Las Vegas to unwind, while others want to check out the Hoover Dam and some of the other major tourist attractions in the state. Most people never even think about what would happen if they are in an auto accident while they are in Nevada. They have no idea what to do if they find themselves involved in a crash. They may think that they need a lawyer but wait to contact someone until they have returned home. They think that this will make it easier for them and keep them from having to travel to Nevada to meet with their attorney when it is necessary. Nevada courts are very specific about who is allowed to represent clients within the state. Attorneys who handle personal injury claims in Nevada must be licensed in the state. If you are selecting a California attorney to represent you, you need to make sure that they have completed the various requirements to handle your case. 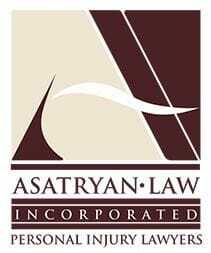 At Asatryan Law, one of our attorneys, Liya Arushanyan, is licensed in Nevada. If you have been injured while on vacation in the state, Liya knows what to do to ensure that your case keeps moving. She will work diligently to resolve your case by negotiating with the insurers involved, and take your case to trial if they refuse to cooperate. If you were injured due to another's negligence while visiting Nevada, we welcome the opportunity to discuss how we can help you.